Dowco offers year-round solutions to keep your landscape tidy. Many of our clients have their trees and shrubs pruned 1-4 times per year depending on their landscape and their level of activity in the garden. All over the St. Louis, Chesterfield and St. Albans areas we’ve seen an increase in the number of trees and shrubs that are being installed in landscapes and the diversity in plants is multiplying. This new awareness from the public in assorted plants requires specialized pruning techniques. Planting a tree or shrub correctly, in the proper location, and protecting it from injury are the best things you can do to influence the life cycle of your plants. The next largest impact is trimming and pruning. Never trim or prune if you don’t know why the tree or shrub requires it. Branches that are weak or broken should be removed. Also, most of the time limbs that are diseased, damaged, and/or pest infested should be removed by pruning. Trimming and pruning a plant, by nature, is promoting new growth. Trimming can also be used to cut back fast growing shoots, suckers or water sprouts to control their growth. Pruning can be used as a method to improve survival chances. Trimming can solve problems with receiving enough sunlight or being too close in proximity to another specimen. Trees and shrubs that are routinely trimmed tend to live longer than trees and shrubs that aren’t trimmed or pruned. There are ways to trim particular trees that will increase their ability to withstand snow, ice and powerful storms. Crossing and rubbing branches influence the health of the plant and should be removed during pruning. Many people commonly trim and prune for visual purposes. Overgrown shrubs are not only unsightly, but they also block views and can allow an entryway for pests if they’re touching buildings. It is possible to trim plants to enhance their flowering, to alter the form, to reduce the size, and to shape the canopy. A good pruning strategy will develop trees and shrubs that are healthy, strong, and gorgeous! 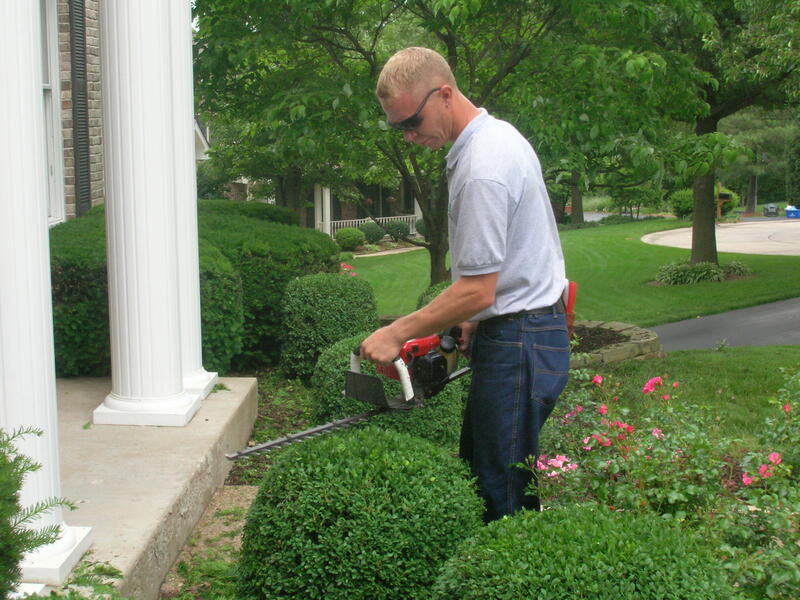 Knowing the proper way to trim and prune your shrubs starts first with knowing when to trim them. The timing can affect many aspects of your plants health including viability and flowering. Flowering trees & shrubs are properly the most finicky and the type of plant that will give you a glaring reminder that it was trimmed at an incorrect time. If you trim a flowering shrub at the incorrect time you risk completely removing the buds that produce the next season’s flowers. The general rule of the thumb to live by when pruning flowering shrubs is to do so just after flowering is complete. This guideline will help to ensure a fabulous flower display next season! Evergreens are a completely different animal as most of them have no true flowers to use a guide. Evergreens can be temperamental -- trim them too early and freeze or frost can damage tips... trim them too late and depending on the timing, heat or cold can damage the plant. When trimming evergreens after the first flush of the year be sure to do so when the plant as adequate moisture and the temperatures are moderate. If you were to trim your evergreen right before a heat wave it is highly likely that the exposed cut would begin to dry out and tip die back may occur. If a late season trimming to clean up summer growth is your goal, do so after temperatures have started to cool. Trimming too early in the fall will allow the plant plenty of time to push out fresh growth which is just what frost and freezes love to destroy. The idea is to trim late enough that the plant will not push lots of new tender growth that won’t harden off, but early enough that the stems have time to do some healing before winter. In St. Louis, our weather is tricky and an exact time depends on the year. Some people mistake trimming for pruning. They are two different things. When you are trimming a plant you are just removing growth on the outer most part of the plant. Pruning is more technical and can require large portions of plant material to be removed. Pruning on deciduous material should be done in the winter when the plant is dormant. This reduces the amount of stress the plant will incur. Pruning on evergreens is best done in spring and fall. However, on either type of plant, deadwood can be removed at anytime safely, so long as proper techniques are used. Whether trimming or pruning a key to remember is that most of the time you never want to remove more than 1/3 of the plant. Keep these tips for timing in mind and you can continue to enjoy your sculptured plants for years to come! If you are unsure about if it is the proper time to trim and prune, ask Dowco! We would love to help. Reduction: Reducing the overall height or width of the plants crown. Thinning: Selective pruning of limbs to allow more airflow through the plant and remove crossing branches. Balancing: Forming a symmetrical growth habit. Completing these projects during the dormant season affords the tree the best situation to heal itself without the pressure of insects and disease. It also reduces the suckering effect that often follows pruning. Our outdoor living professionals view the landscaping as a whole! We will start with the largest shrub and lightly touch smaller shrubs as needed to allow them to catch up to create symmetry in the hedge. When Dowco trims we pay attention to the details including removing the suckers growing on trees that deplete the nutrients from the desirable growth. We will ask questions and listen to your desires. Some clients enjoy tightly trimmed shrubs while others prefer them to have more texture. When talking with your Dowco representative, it’s important to communicate your sense of “landscape style”. Do you prefer a formal or a natural garden? Do you like your Boxwoods in a hedge or individualized? A good pruning strategy will develop trees and shrubs that are healthy, strong, and gorgeous! Let Dowco help you plan your yearly trimming and pruning strategy for healthy plants.